Originating from the turn of the century, Manor house 'Knabens Villa' is located in the Rhineland, between Cologne and Dusseldorf, directly at the nature reserve 'Zonser Grind'. The property consists of three buildings, with the lovingly renovated Coach House available for rent as a holiday home directly from the owner. The property is suitable for two people. 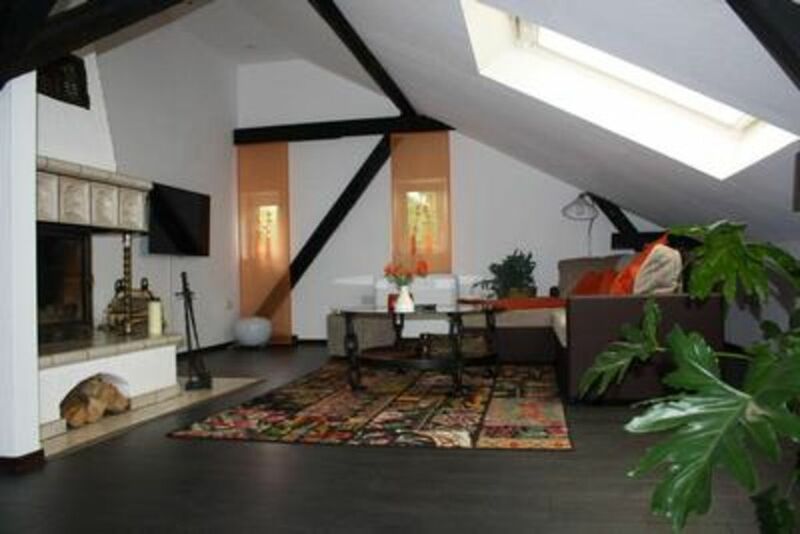 The coach house has a living area of about 70 square meters, spread over two floors. On the ground floor you will find the renovated bathroom with shower and toilet. A fully equipped kitchen with cooker, refrigerator, microwave with convection oven, kettle, washing machine. Ironing board and iron are provided. In addition, there is a cozy dining area for up to four people. The adjoining bedroom has two comfortable single beds and a spacious wardrobe. The large living room on the first floor extends over the entire surface of the building. You will find there the rustic fireplace, a comfortable corner couch and a modern flat-screen television. Also in the living room there is a desk for incidental office duties, with a fast wireless Internet access free to all guests of the Coach House. To the south-western side oft he property is a terrace for guests outside enjoyment..
Free parking is located directly at the house. Animal husbandry is possible on request. Smoking is not permitted inside the house.